Operatives of the Assistant Inspector General of Police’ (AIG) Zonal Intervention Squad (ZIS), Onikan, have arrested two suspected ritualists in Ogun State. 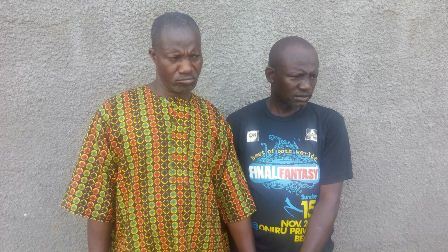 Taiwo Adeleke, 47, and Kayode Oseni, 52, were apprehended at Abule Ifa, in Obafemi Owode after detectives uncovered the alleged ritualists’ den used by criminals to fleece people of their money. According to the zonal spokesman, Muyiwa Adejobi, a Superintendent of Police (SP), policemen had mounted on surveillance on the activities of the culprits, following a tip off. Adejobi said that the den, a massive ediffice, had names of prominent persons who might have fallen victims to the suspects inscribed on it. Also seen at the place we’re fetish materials/structures, charms, figurines and shrines, said Adejobi. He said: “The AIG Abdulmajid Ali led a team of senior officers including the Commissioner of Police (CP) Ogun State, Ahmed Iliyasu, Deputy Commissioner Operations Zone II, Suleiman Balarabe, a DCP, ZIS Commander, Gbenga Megbope, a Chief Superintendent (CSP) and Commander 16 Police Mobile Force, among others to the scene for on-the-spot assessment. “They also designed possible legal means to take over the dangerous den and dislodge the syndicate.